For the first time in 20 years, locals can enjoy some of the popular trails of San Luis Obispo open space after sunset, as part of a new city "evening access" pilot program that kicked off with the end of daylight saving time on Nov. 5. 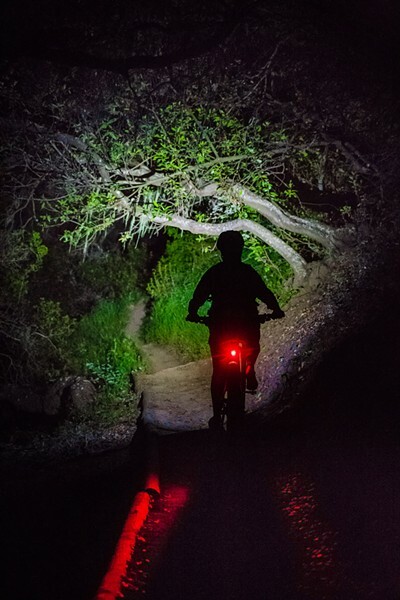 AFTER HOURS Cerro San Luis Mountain in SLO is now open for hiking and biking until 8:30 p.m., as part of a winter pilot program that launched on Nov. 4. Don't forget to claim a permit online, bring a light, and stay in groups. Until clocks turn back again in March, Cerro San Luis Mountain, also known as Madonna Mountain, will be accessible to the public until 8:30 p.m. via a daily permit system. Up to 65 hikers, runners, and bikers can traverse the city-owned trails—the Lemon Grove Loop and "M" Trail—each evening through the trailhead on Marsh Street. All other SLO city open spaces will remain closed at night (one hour after sunset to one hour before sunrise). "Bring light and stay in groups together," advised Bob Hill, deputy director of the SLO Office of Sustainability. "And one thing that's really, really critical at night is to keep dogs on leash and keep the noise down." Night hiking permits are available—first come, first served—at the smartphone-friendly website, slonighthikepermit.info. Permits are capped at 65 to limit the impacts on open space wildlife. Make sure to bring proof of your permit out on the trail, as city rangers are present both at the trailhead and on the mountain during night hours. Alcohol consumption and smoking are prohibited. Fines for violations are $561. "The rangers are really present," Hill said, adding that there have been no negative incidents or tickets issued thus far. "People seem to be really well-behaved and appreciative." During the program's first week, Cerro San Luis saw an average of 15 to 20 trail users each evening. The city says it's closely monitoring the open space, as well as the permit numbers, to understand how the program is affecting the habitat. That was a chief concern among local residents as the SLO City Council intensely debated the issue last year. "We've done all the things we've promised we'd do," Hill said. "We did pre-launch wildlife surveys at night and some spotlighting and wildlife calls and observed some of the standard things we see out there, like deer, skunk, possum, and a bobcat. We continue to have our wildlife game cameras." • On Nov. 7, a group of Morro Bay senior citizens graduated from Peoples' Self-Help Housing's Google Chromebook 101, earning them a certificate and their very own Chromebook. The new, free program was offered to low-income seniors living at Ocean View Manor and Oceanside Gardens, thanks to funding through the California Advanced Services Fund, a California Public Utilities Commission program. Participants attended four two-hour trainings on using their Chromebooks, safely surfing the web, and connecting on social media. • The Templeton Chamber of Commerce announced the hiring of its new executive director on Nov. 2, Jessica Main, a local business owner who's worked closely with the Atascadero Chamber of Commerce for years. Community members are invited to meet Main at the Templeton Christmas Tree Auction & Dinner on Dec. 8 at 5:30 p.m. in BarrelHouse Brewing Company's sour room.